Senior living is changing rapidly, and so is its interior design. At Warner Design Associates, we’re excited to see the progress that is leading toward more innovative, interesting and fulfilling design amongst senior living communities. Gone are the days of designing senior living communities in what some might call a standard, generic manner. Today, senior living communities are excited to show that senior living is a far cry from this cookie-cutter or institutional stereotype many have in their minds by creating a more “home-meets-hospitality” type feel. This includes utilizing more luxe and contemporary designs, fabrics and materials that today’s seniors are loving. We’re seeing more white cabinetry, color blocking, solid textures, gray and silver paint colors and finishes, and neutral base palettes accented with dramatic pops of luxe colors. In everyday life, we’re surrounded by people of different ages and from different parts of the community. It’s important to continue this normalcy into senior years. Senior living owners and operators today are focusing on creating senior living communities that do not isolate seniors, but instead keep them engaged and active with their families and communities by building them near grocery stores, colleges, restaurants, or other urban environments where residents can participate in the community, volunteer, meet and socialize with others and build intergenerational relationships. Within the senior living community, this means creating spaces where guests of different ages can spend time, such as multi-purpose rooms where volunteers leading activities or game and homework rooms for grandkids visiting their grandparents. Spending time outdoors has significant health benefits such as improving quality of sleep, reducing anxiety, improving creativity and brain function, and promoting overall wellness. Senior living communities are incorporating more outdoor wellness areas and activities, and we are looking forward to watching this trend continue! Today we’re seeing more areas for gardening, socializing around a firepit, taking group exercise classes or using individual exercise stations, and walking trails wide enough to allow for groups, among other attractive landscaping trends. (Don’t forget: though we’re called “interior designers”, we can help design outdoor spaces in coordination with landscapers and architects.) See more about the importance of outdoor living spaces in senior living. 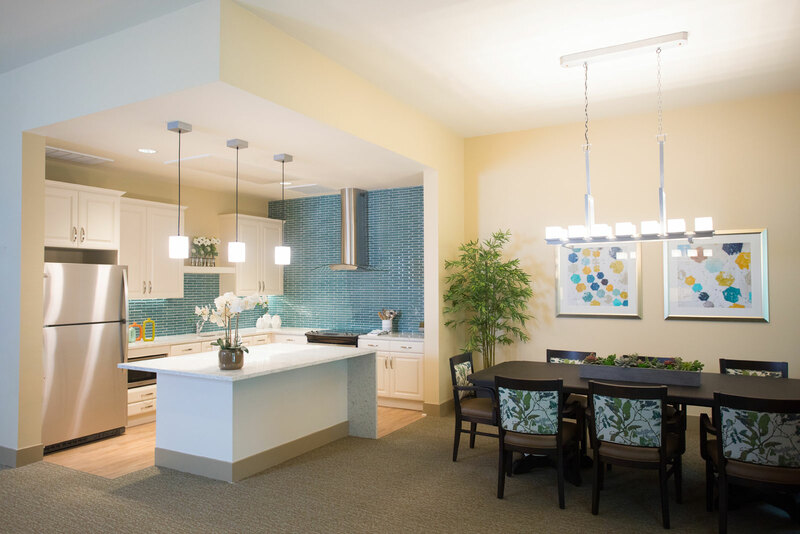 Natural lighting has long been a desired design feature, but with more recent research showing the impact of lighting on residents’ circadian rhythms, we’re starting to see senior living communities more frequently incorporate natural and tunable lighting into their designs. Buildings are taking advantage of natural light with strategic window placement in common and private rooms, and tunable lighting systems that can vary color temperatures and shift from daylight to candlelight, for example. What senior living interior design trends are you most excited about right now? Tell us on our Facebook page!